Loops of pipe beneath the ground are used, either horizontally in trenches, or vertically in boreholes. The best option will depend on the amount of land available and its characteristics in terms of soil type, water content and the geology beneath the surface. The collector loops are laid at a depth of 1 metre below the ground, where the temperature is stable throughout the year. They are filled with a brine mixture of water and antifreeze which extracts heat from the surrounding ground as it is pumped around the system. 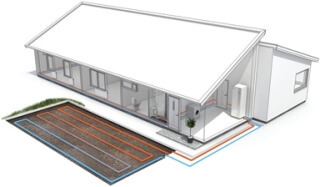 We would recommend single horizontal pipes rather than “slinky” collector loops to ensure that no more heat is taken from an area of ground than the sun can replace during the year. This avoids the problem of the ground freezing, which results in your heat pump not working. Vertical boreholes can be drilled down to depths of up to 200 metres, depending on the ground conditions. These contain a closed collector loop containing the brine mixture. Multiple boreholes can be drilled for larger properties. Harder rocks, such as granite, have a higher thermal conductivity than softer rocks, and therefore a higher efficiency. We would always suggest a geological survey so that we can give you the best possible advice. If there is a suitable body of water close enough to the property, this is the most economical option. Collector loops are simply placed on the bottom of the lake and weighted down to keep them in place. This is an option if there is an underground aquifer beneath the property or a body of moving water. Instead of a closed system containing brine, the groundwater is pumped to the surface and through a heat exchanger, before being returned to the ground. A hydrological report will determine if the ground is suitable – we can arrange this for you. The extraction of ground water is usually subject to a permit, depending on the flow rate. 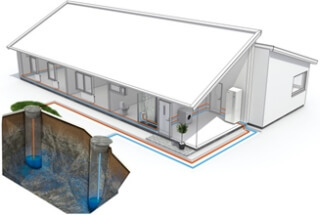 To find out more about ground source heat pumps please see FAQs. 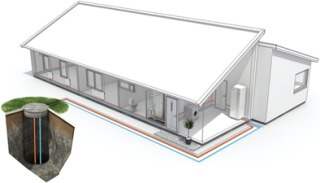 If you would like to discuss how a ground source heat pump could benefit your project please contact Fervo Renewable Energy on 0333 240 2121 or make an enquiry.